Nionios is a spacious open plan cottage style villa with living room, kitchen/dining, double bedroom area and bathroom. With its quiet location above Gaios and romantic setting, Villa Nionios is the perfect choice for a honeymoon couple. Access to pool via: Roman steps. 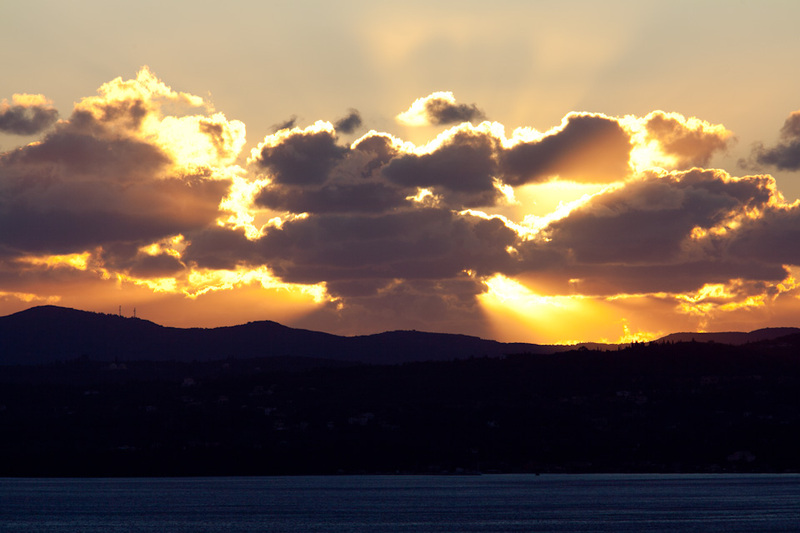 Each evening you will be treated to the most romantic sunsets reflecting over the pool! Beautiful villa in a stunning setting. The photos dont do it justice ! Its much prettier than we expected... Very prompt and sympathetic response from Agni when the ferry was cancelled and another nights stay in the villa was required . Would definitely recommend Agni travel and the villa ! This is the fourth annual holiday that we have booked through Agni travel to stay at either Villa Gallini or Villa Nionios in Paxos. 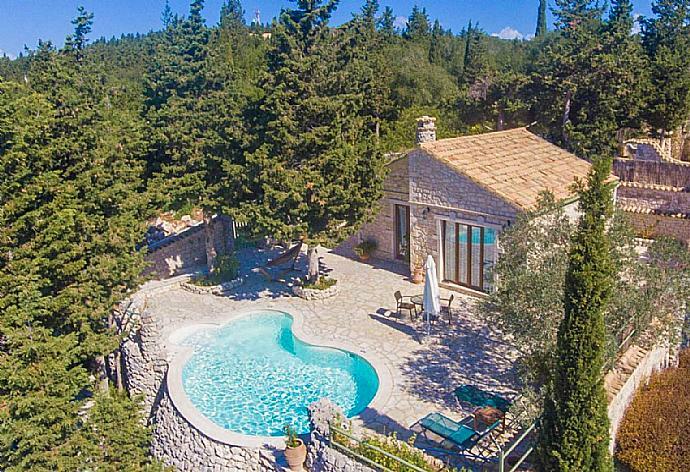 We have had delightful holidays on each occasion, facilitated by the excellent relationship built up between Agni Travel, their agents in Paxos and the owners of these two villas. This in turn contributes to a trouble free holiday for us, the customers, whilst we are staying on the island, and a positive ongoing relationship between us, the Agni Travel team (both in the UK and in Paxos) and the villa owners. From the outset we have been welcomed as friends each year and we look forward to spending a fifth holiday spent on this very beautiful island. Lovely property with a perfect pool area. Everything was organised efficiently from the original booking to arrival and then departure. Your recommendation of Eos Travel helped our whole holiday go smoothly. We will definitely use this partnership again. The property was just what we were looking for and we have no complaints. Absolutely lovely, thoroughly enjoyed the stay. We had a fantastic time we loved the villa and the island of Paxos and cant wait to return. The week went so fast and we really didn't want to come home. Thank you for your efficient friendly service. Would stay in the villa again - Agni Travel made it all very easy including picking up & leaving the car. Lovely place, description accurate - we were recommended by a friend who stayed there also. Agni Travel and their partners were excellent. The villa is perfect for a couple or young family. We arrived, a cot and high chair was left for us and Agni Travel were amazing. Within minutes of arriving they also delivered sheets for us, so our young baby could crawl stress free. No stress, beautiful views and 3 tavernas within walking distance. What was even more enjoyable was having dinner at the villa owners restaurant - a true character. Super time - thanks Maria; the local agent too for all assistance at Agni Travel. Would book the villa again. I would like to start with thanking Agni and Eos Travel for making our holiday run very smoothly. Your help was perfect.The villa was comfortable quiet and a perfect location for a relaxing holiday. We loved our time there and Paxos as always is a beautiful Island. We have just returned from two weeks staying in villa Nionios on the beautiful island of Paxos and would like to say a very big thank you to all the staff at Agni Travel and Eos for the wonderful service everything was arranged and carried out so well. We will most surely use them again also a very big thank you to Yanis who owns villa Nionios for all his help and hospitality we will be returning as soon as possible, so until then we would like to wish you all a very restful time for the winter months and once again a very big thank you. We had a wonderful time at Villa Nionios. The house is in a great location, fabulous views, quiet and peaceful within easy reach of Gaios for essential shopping and eating out.Villa is beautiful, quality furniture and appliances. Relaxing outdoor space and lovely pool though a little chilly in October. Could not fault cleaning and maintenance. Everything was perfect and we hope we can return.Many thanks for a great stay. The overall holiday was wonderful and Paxos is a magical Island.The villa is beautiful and beautifully made (a credit to the owner). The cleaning is first class and the owner is lovely and friendly.We are planning to return to Paxos next year. We had a lovely holiday. The property was just what we expected and we were comfortable and had all we needed.We left a message about the coffee pot that we broke - should we do anything about paying for it. Thanks for everything we would love to return when we get a chance. Our holiday was perfect from start to finish. The villa is immaculately maintained and having met Yiannis; the owner we were delighted with the standard of accommodation. 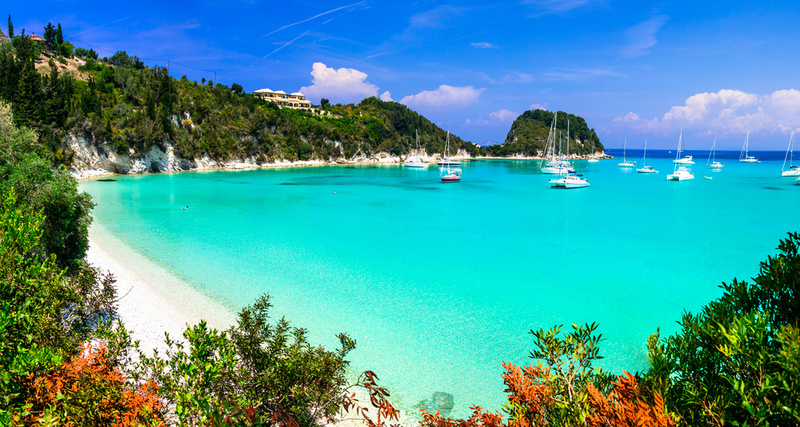 We would definitely revisit Paxos more than likely going back to Nionios. I should also commend Agni Travel as their communication throughout the booking process was superb. Please also convey our thanks to Spiros; the taxi driver who was waiting for us at the airport and conveyed us to the port swiftly and without any issue. Many thanks for all your help and we look forward to working with you in the very near future . Our holiday was more than perfect. It was almost magical. We love the villa and the island. We think about visiting it once again soon. Excellent we really enjoyed it and weve booked to go back next year. As always we enjoyed Paxos. Supremely relaxing beautiful house and surroundings. Would consider booking again and using your company as service was great. Many thanks for a memorable holiday. A lovely villa and a lovely island.